Libya faces an ever-worsening currency and liquidity crisis which cannot be surmounted without a stable political solution that definitively concludes the struggle for power and legitimacy ongoing since 2014. Yet, the root of the crisis lies not in politics but in the deepening distrust toward Libya’s public financial system as a whole. The banking system, which appropriates Libya’s oil income and sovereign wealth, is the locus of unique popular disdain. In addition, General National Congress Prime Minister Ali Zeidan vastly expanded the budget in 2012 and 2013, when oil prices were high and Libya was relatively stable; this left his successors with a range of financial commitments they cannot meet. Compounding these budgetary woes is the emergence of a new predatory social and criminal institution: currency traders who double as smugglers of foreign currency out of Libya. These villains try to capitalize on three overlapping factors: the public’s distrust of the banking sector, their need for foreign currency, and the spread between the official and black-market rates of the Libyan dinar. These currency ‘smugglers’ managed to drive the value of the dinar down from 6 to 10 dinars per U.S. dollar in the space of three days in mid-April 2017, while profiting from the trading arbitrage opportunities thus generated. Given the existing budgetary commitments and the psychological legacy of the past few years even if a political resolution to the post-2014 civil war was miraculously achieved, this cannot by itself solve the financial crisis. Confidence in banks will remain low and the currency crisis will persist unless a future political reconciliation is itself built on an agreement on key economic and fiscal rules that can help any successor government restructure the economy and incentivize the Central Bank of Libya (CBL) to undertake major structural decisions such as the official devaluation of the Libyan currency. Until this widespread public distrust of the country’s institutions is overcome with an agreement on overarching rules governing how oil money is distributed in the new political system and how the new economy operates, it will be impossible to solve the root causes of the liquidity crunch. This report contextualizes the liquidity and currency crisis, examines ongoing developments, and looks at how it affects the economy as well as the lives of ordinary Libyans. In conclusion, the Libyan economy and its currency is headed towards a rapid collapse if the vicious interlinked cycles of inflation and bank insolvency continue. As explained in this special report, the roots of this crisis are deeply structural, but Libya has actually been able to weather the storm quite well over the last 6 years due to plentiful supplies of foreign reserves accumulated from the sale of oil over the last 10 years. These reserves were largely used by the Central Bank to fund the extremely large deficits of the last 4 years. The tipping point of reserve exhaustion and public frustration has only recently been breached. Since then, the Libyan people’s trust in the whole financial system has been decimated as they have begun planning privately for the financial meltdown which is around the corner even if publicly Libyan officials have not begun making such long-term calculations. If Libyans were at first shocked when the dinar plunged to 2 per dollar, at this point they are numb. The black-market rate is now at 8 dinars per dollar and projected to permanently exceed 10 if no macroeconomic readjustments or significant increases in oil production are achieved. 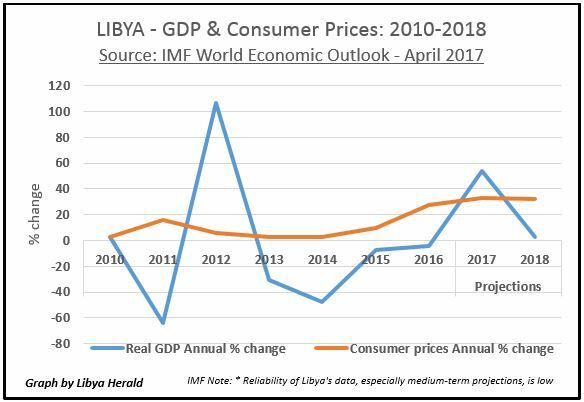 Furthermore, Libya’s surging inflation may have irreparably damaged the public confidence in the country’s local currency. 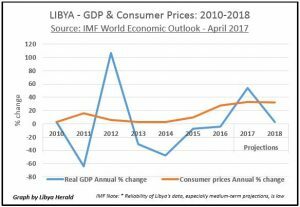 If left untreated, Libya could become like various Latin American economies where housing and car prices are quoted and paid for only in dollars and significant inefficiencies are introduced into the whole economy by the eclipse of the national currency as the primary vehicle of commerce. A blanket political resolution is necessary, but without this resolution being founded upon a new economic deal governing how oil revenues are managed by the redistributive banking sector, it will be insufficient to permanently rescue the economy no matter how much oil Libya has underneath the ground or how much reserves it has stashed away in Western banks. Prior to whole cloth re-writing the Libyan socio-economic contract, temporary fixes are required in the meantime to calm the psychological drivers of the current crisis. 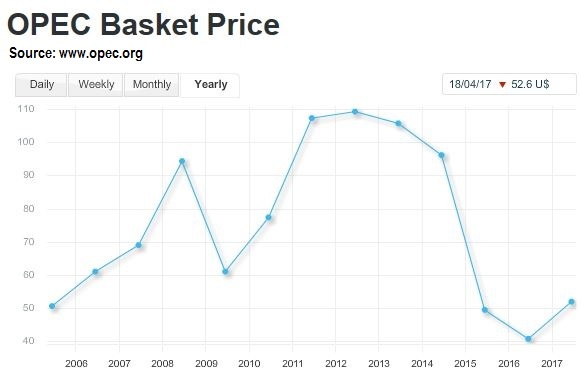 One such fix that is being argued by a range of Libyan actors, from the heads of various banks and business associations to the top ministers of the GNA, is gradual or a one-off devaluation of the Libyan dinar, coupled with a policy to provide dollars at the new rate. If this was done without restrictions to traders and personal consumers it would drive up the value of the Libyan dinar in parallel exchanges and bring back trust and liquidity into the banking system. However, without the larger structural budgetary element, this step would still be unlikely to put a permanent stop to the dinar’s slide relative to the dollar. Another temporary fix would be to find ways to ensure that Libya’s oil production and revenues rebound, by addressing the ongoing civil war on the one hand and the budgetary problems which are currently standing in the way of utilizing more investment in necessary oil infrastructure to drive Libya’s recovery of crude production. It could also be argued that without a comprehensive economic and political deal, there will be no guarantees that oil keeps flowing as various social sectors have repeatedly demonstrated their willingness to shut off production if they feel they are not fully sharing in its gains. 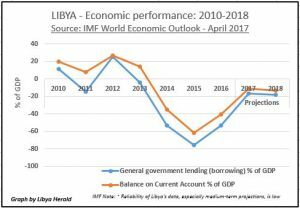 Many international analysts and domestic and diaspora Libyan intellectuals believe that Libya needs a major economic deal to underpin a political resolution that can resuscitate the economy and bring back trust to its currency. There are already calls by some Libyans who have been putting forward for some time plans for a Libyan Economic Agreement (LEA) to make the stalled Libyan Political Agreement (LPA) workable. The LEA would establish new fundamental principles and guarantees governing the new economy and its entire Public Financial system. The Central Bank of Libya would have a critical role to play in this framework and could bring back trust to Libya’s failing economy in a new way. The basic principal of the LEA is inalienably guaranteeing each locality/municipality (based on population), and each individual citizen, a fixed amount of Libya’s resource and sovereign wealth in. This would then obviate any incentives to fight over resource distribution. 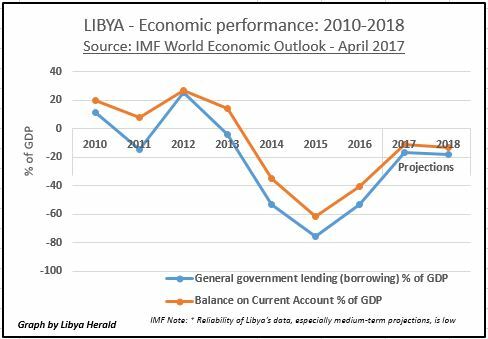 Baring such a comprehensive rethink of Libya’s public finances, the country is likely to remain mired in political conflict and economic instability. Nonetheless, while Libya’s social contract is waiting to be changed — from its Qadhafian iteration of popular quiescence in exchange for a modicum of stability and an unequal distribution of the spoils of Libya’s oil wealth, to a more equitable and empowering social contract — structural, economic, monetary, and political reforms are needed so that Libya’s sovereign wealth is not irrevocably dissipated. To read further detailed analysis in the full 29-page pdf report click here. This report has been authored by Jason Pack, Executive Director of the U.S.-Libya Business Association, Founder of Libya-Analysis®, and Emeritus Director of EyeOnISISinLibya.com. This research is meant to promote the joint educational aims of the US-Libya Business Association and of the Libya Investment Summit 2017 hosted by IRN at the Pera Palace Hotel from 9th-11th May 2017 in Istanbul, Turkey. All companies which find out about this summit as a result of reading this special report (and have not previously registered) shall be granted a 10% discount per attendee by utilizing the promotional code ‘LIS10’ when registering via the official event website. The Libya Investment Summit will address numerous business opportunities within Libya. The conference will be a platform where many prospects for investment will be presented. There will be a major focus on construction/reconstruction, banking, infrastructure, risk management, and the oil & gas industries. The issue of the liquidity crisis, impact of possible devaluation of the dinar, and changes in Letters of Credit procedures will also be discussed. Delegates will be able to gain a first-hand insight into the present state of play for conducting business on the ground and have dialogues and discussions with key stakeholders — learning how to engage in successful business and investment strategies in Libya. Therefore, please utilize this discount code and book your attendance. The U.S.-Libya Business Association (USLBA) is the only nonprofit member-based trade association focusing solely on the United States and Libya. Since its incorporation in 2005 the USLBA has sought to facilitate opportunities for mutually beneficial trade and investment, enhance the bilateral diplomatic and commercial relationship, and educate the public about the importance of U.S.-Libya economic ties and about the complex issues facing the Libyan economy. This special report constitutes the performance of USLBA’s educational function. The USLBA welcomes inquiries about our program and the benefits of membership. USLBA would like to thank Sami Zaptia of the Libya Herald for his prompt and helpful edits, his longstanding friendship, and for seeing the importance of a rigorous treatment of this subject for promoting business in Libya. Sincerest thanks also go to Hamam Elfassi, Hedi Sal, Brian Stout and Lydia Jabs. The views in this article do not necessarily represent the views of Libya Herald.